During the 1830s the great English geologist Sir Roderick Impey Murchison was studying fossiliferous strata outcropping in the hills of South Wales. He named this geological stage the Silurian System, after the Silures, an ancient Celtic tribe that lived along what is now the Welsh-English border. In 1835 Murchison and Sedgwick presented a joint paper, On the Silurian and Cambrian Systems, Exhibiting the Order in which the Older Sedimentary Strata Succeed each other in England and Wales, which laid the foundation for the modern geological time scale. During the following years a bitter controversy arose between the two former friends over the relative status of the Cambrian and the Silurian. This was only resolved in 1879 by the formulation of a further, Ordovician period as intermediate between the two stages. The early Paleozoic saw the continents clustered around the equator, with Gondwanaland continues it's slow southern drift. Meanwhile Siberia, Laurentia and Baltica converge at the equator. By the end of the Silurian, these colliding continents had began to raise mountains and forge a new supercontinent, Laurussia. See also the very useful biostratigraphic chart at Silurian Time Scale. The Earth entered a long warm greenhouse phase. However latitudinal variations in climate were rather similar to today, with glaciers occurring in the higher latitudes (over 65o). Regions of marked aridity occurred within 40o of the Silurian equator. Warm shallow seas covered much of the equatorial land masses. The Much Wenlock Limestone Formation of Britain reveals one of the most diverse, and well-preserved fossil assemblages known, with well over 600 species of invertebrates recorded. The Much Wenlock Limestone Formation of Wales and the Welsh Borderland contains a diverse fauna of well over 600 species (mainly crinoids, corals, brachiopods, trilobites, algae and bryozoans) deposited during the early Silurian when this area was covered by a relatively warm, shallow shelf sea. The Crinoidea account for around 10% of this number with an estimated 35 genera and 56 species. "The Much Wenlock Limestone Formation of Wales and the Welsh Borderland contains a diverse fauna of well over 600 species (mainly crinoids, corals, brachiopods, trilobites, algae and bryozoans) deposited during the early Silurian when this area was covered by a relatively warm, shallow shelf sea. However, the Wenlock bryozoans remain poorly studied and understood, even though they constitute an important part of the fauna. Species concepts are often insufficient, and there is a need for revised descriptions, incorporating thin-section work. Furthermore, phylogenetic, ecological and functional morphological studies also need to be carried out, as these areas have not been investigated in detail. Preliminary work on one particularly characteristic Wenlock bryozoan, Ptilodictya lanceolata (Goldfuss, 1829), a cryptostome, has revealed new information on its functional morphology, together with patterns of seasonal development based on zooid measurements. In addition, multivariate statistical analyses are currently being used to review the fenestrate species. Past workers have relied too heavily on the so-called micrometric formula and, as a result, taxonomically important characters have often been overlooked, and little thin-section work has been carried out. It is hoped that this research, utilizing a wider range of characters, will provide a reliable taxonomic platform for the study of Silurian bryozoan phylogeny and palaeoecology" (Snell 1999). "The Much Wenlock Limestone Formation of Britain reveals one of the most diverse, and well-preserved fossil assemblages known, with well over 600 species of invertebrates recorded. The Crinoidea account for around 10% of this number with an estimated 35 genera and 56 species. The high quality of preservation has revealed a range of small-scale morphological features among the aboral surfaces of the arms and calyces of this group. Small, circular to sub-circular depressions and parabolic traces are randomly situated in the calcite plates of a number of the crinoid taxa. A small number of these features indicate in vivo formation through the presence of rims and gall-like features surrounding the trace. These structures are interpreted as a response by the crinoid to the presence of another organism through either a mechanical or a chemical stimulant. The lack of penetration into the body cavity and the extent of the reaction structures suggest a symbiotic relationship existed between host crinoid and trace maker. A high degree of host-selectivity is observed with only 15% of crinoid species being affected. This number includes some of the most abundant crinoid species in fossil collections as well as a number of much rarer species. Work is now commencing on the taxonomic identity of the pit-producing organisms" (Widdison 1999). Brachiopods are the most common hard-shelled organisms, making up 80% of the total species. Among these, pentamerids first appear and are abundant, rhynchonellids, and the spire-bearing athyridids and atrypidids are also common, as are other groups that continue from the Ordovician. Planktonic graptolites remain common and diverse. The single-spined Monograptus is the predominant genus, and its species are useful as zone fossils. Jawless fish invade brackish and fresh water, as do eurypterids, xiphosurids, scorpions, which may have been semi-aquatic. rhyniophytes, primitive lycophytes, and myriapods became the first proper land organisms. At the end of the period Jawed fish appeared for the first time, but they remain insignificant. A Silurian sea floor, showing numerous tabulate corals of the genus Favosites large Stromatoporoids, the "sunflower coral" (possibly a green alga) Ischadites, and rugose corals of the genera Entelophyllum, Kodonophyllum, Streptelasma and Craterophyllum. Crawling among the coral and stromatoporoids are various kinds of gastropods. In the background are crinoids of the genus Laubeocrinus, and orthocerid straight shelled nautiloids (Kionoceras). 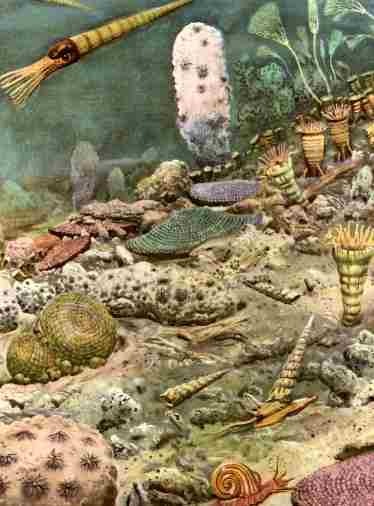 "A view of the mode of life of some Silurian nautiloids. In the top left a large orthoconic form [probably an Actinocerid or large Orthocerid; the shells of either of which reached a meter or more in length] swims forward, it's buoyancy nearly neutral and its hyponome bent back; its upper surface may have been camouflaged to allow the further possibility of a more concealed resting position on the sea floor, but these large nautiloids were at the top of the food pyramid and presumably had little to fear. The smaller orthoconic species below has remained undetected, its camouflage effective in the dappled light of the photic zone; it swims away backwards. In the bottom right a microphagous gomphoceroid [either an Oncocerid or a Discosorid, both independently evolved a very similar lifestyle and morphology] is suspended quietly in its vertical position; it would not have been obvious from above and may have had camouflage markings (not shown); in any case it could retract entirely within its shell. The cyrtoconic species [an Oncocerid] shown scavenging on the substrate has camouflage all round its shell; however its hyponome would permit swimming, when the cyrtocone would be brought to a more horizontal attitude. The torticonic Foersteoceras-like form is shown in its customary benthic position, though it could use its hyponome to direct an ascent through the water. In the upper right an Ophioceras is shown as a nimble and (unlike the large orthocone) highly maneuverable swimmer; it and the other forms are shown approximately to scale. Most streamlined and effective swimmer of all was the mature ascocerid shown above." A typical Silurian (Wenlock-Ludlow) vertebrate fauna from Saaremaa Island, Estonia. This fauna is dominated by agnaths, including thelodonts (1, Phlebolepis), heterostracans (2, Toypelepis), anaspids (3, Rhyncholepis), and osteostracans (4, Procephalaspis; 5, Witaaspis; 6, Thyestes; 7, Dartmuthia; 8, Tremataspis; 9, Oeselaspis). Jawed fishes are also present, especially acanthodians (10. Nostolepis) and possibly the earliest known osteichthyans (11. Andeolepis, known only from isolated scales and teeth). All these fishes lived in a marine environment, but osteostracans were more confined to lagoonal, shallow-water facies, whereas acanthodians and thelodonts were probably epipelagic. "Eurypterids, an extinct group of aquatic chelicerates, were undoubtedly affected by environmental constraints imposed by their physiology and gross morphology, as are modern aquatic organisms. Kjellesvig-Waering (1961) proposed a series of distinct ecological phases for eurypterids, defined by the environment in which they lived, and based on the Upper Silurian Welsh Borderland fauna. 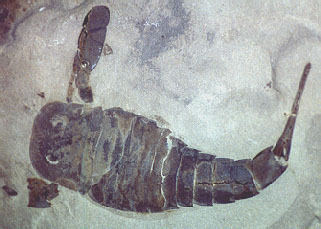 However, evidence from the eurypterid fauna of the Upper Silurian Bertie Waterlime Formation, New York, suggests that two distinct transitional assemblages existed, perhaps caused by a difference in the environmental preferences of juvenile and adult eurypterids (‘ontogenetic segregation’) (Manning 1993). The eurypterids from the Upper Silurian of the Welsh Borderland may represent a previously undescribed, ontogenetically mixed, eurypterid assemblage, influenced by a series of facies changes; this is supported by sedimentological evidence (Manning, 1993). The distinct ecological phase model (Kjellesvig-Waering 1961) is rejected in favor of ecological gradients overlapping non-distinct eurypterid phases (inter-phase mixing). Inter-phase mixing might have been complicated further by the influence of ontogenetic migration of species across both physiological and environmental gradients. Combining this with new fossil evidence on the dual respiratory and osmoregulatory systems of eurypterids (Manning 1993; Manning & Dunlop 1995) leads to a better understanding of the palaeoecology of this enigmatic group" (Manning 1999). The first fossil records of vascular plants, that is, land plants with tissue that carries food, appeared in the Silurian period. They were simple plants that had not developed separate stems and leaves. A good introduction to the Silurian period (complete with map) is included in the The Virtual Silurian Reef site.